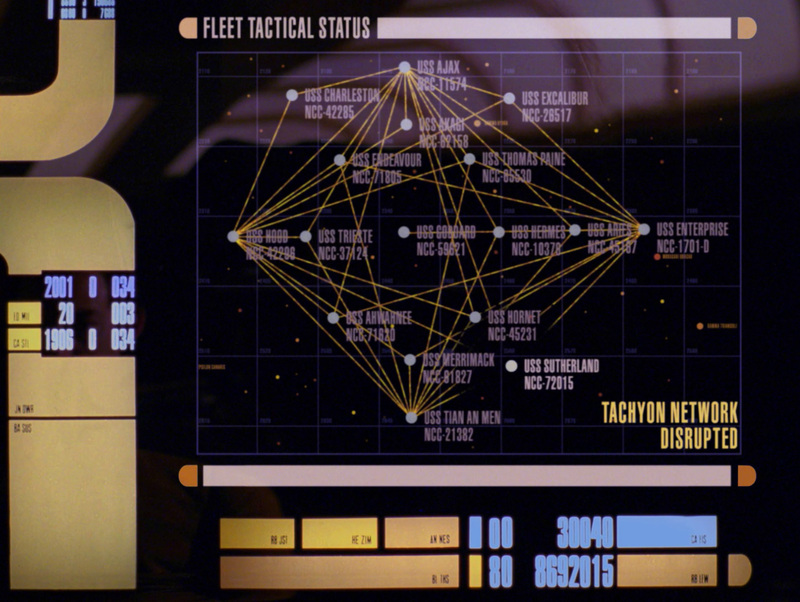 Has anyone ever made a stab at doing the Tachyon Detection Grid, the way it was done for Star Trek Online? Unfortunatley not all of us have played STO so you would need to explain more. However, to my knowledge the Tachyon Grid has never been done properly in armada. I suspect only Fleet Ops would know how to do it justice. Tachyon Detection Grid is an ability that gives the player ship and allied ships a strong boost to sensing abilities, as well as a small one to their stealthsight (cloak detection). If allied ships are in range, the ability's range is extended (it is unclear how much though). I believe it's also range dependent, so that the closer you are, the more likely to detect. A line forms between nearby allied ships, and anything that crosses between is spotted. It'd be an ambitious power to try to duplicate, but perhaps something like the Chain Reaction Pulsar could be used as a base to get the beams working. I'm thinking about something similar for a while. You could either use the FO method as D_N suggested or you could add a very short ranged Tachyon Detector for all Fed ships with a prerequisite of a pod or a special weapon to be activated (which is an area weapon) and so if the ships stay close enough to each other, they would function as a Grid. you could add a very short ranged Tachyon Detector for all Fed ships with a prerequisite of a pod or a special weapon to be activated (which is an area weapon) and so if the ships stay close enough to each other, they would function as a Grid. Isn't that already how it works in Armada? Pretty much, the way it works in vanilla is basicly the ship gets a cloak detect weapon, with a range value. Any cloaked ship within that range is visable. Fleetops does something similar, however only some ships become visable rather than a whole fleet. starfox1701;5427891Isn't that already how it works in Armada? Actually no. Only cloaked ships within the range of the sensor pod or Venture is seen. If there is an ally within range of the pod or venture, it does not affect the sensing field. The way it works in STO is, when the Admiral Level Nebula activates its grid, any cloaked ship with 10 km is seen. If there is an ally withing 10 km, then the grid is seen within 10 km of the ally along with the Nebula. If there is another ally within the 10 km of the first ally, the grid is extended even further. There is a probe weapon in the game that can detect cloaked vessels. Perhaps if somebody could make a multi-target weapon with the probe and get it to target friendlies within a certain radius something similar could be achieved.